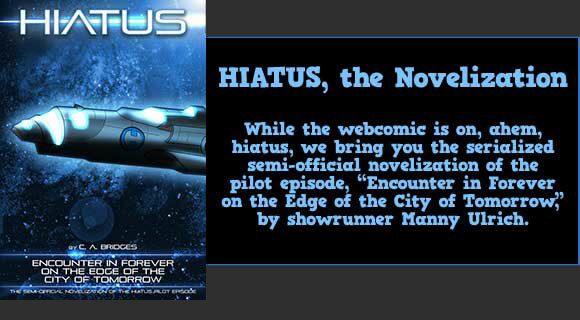 Save Hiatus » Archive » Science! Tuckby rushed over to them. “This is the culmination of my life’s work! I, Marcus Tuckby, have managed to stop time in its tracks!” He was a gesturer and inveterate arm-waver, never a good sign. “Behold!” Without warning Tuckby spun and dashed back to a small table directly underneath the massive device. It was burnished steel, about the size of a footstool, and contained… nothing. There was even a dramatic spotlight aimed at the table, to highlight the nothing. The lab techs and assistants stood around with an eerie, worshipful silence. Buchanon gripped Parvo’s arm and dragged him over to look at the nothing. They looked at it for a long moment as Tuckby beamed with pride. “Well, I’m impressed,” Parvo said. The room breathed a collective sigh of relief. “Of course, of course, let me show you,” said Tuckby, flushed with the endorphins that a near-death experience brings. He snapped his fingers at the terrified techs, who scurried to various positions behind protective plasteel barriers around the room (except for the smallest, shame-faced lab tech, who had to go change his lab coat). Lights flashed. The massive monstrosity over them began to hum and spin slowly. “Nice,” whispered Buchanon, smiling straight ahead. “I’m going to kill you with fire,” Parvo whispered back, smiling just as brightly. Several smartass comments rose to mind, but Parvo was deeply into “get this over with yesterday” mode and held onto his snark with an iron mental fist. Too bad, there were some good ones. He also figured anything he asked at this point would make him look unbelievably stupid, so he settled for raising an eyebrow. This entry was posted on Monday, September 29th, 2008 at 9:16 am.